The 2012 Tour de France came to a close Sunday and Bradley Wiggins, the favorite to win it all, stood on the top of the podium sporting the yellow jersey. It wasn’t a surprise but it did mark the first time a British rider would win the Tour de France. 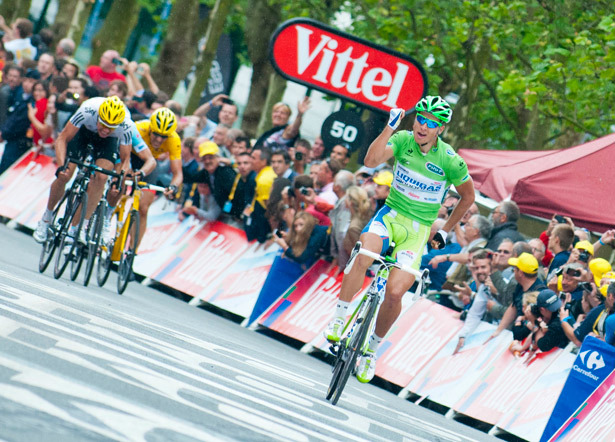 Here’s the most memorable moments from the 2012 Tour de France. Peter Sagan wins stage 1 in style. We all knew that Mark Cavendish was hands down the best sprinter in the race but we didn’t know how he’d perform without the dedicated lead out train that’s he had on his previous team. Now a member of Team Sky, their focus was squarely on putting Bradley Wiggins in the yellow jersey. Simply put, Cavendish would have to make his own fortune. Cavendish won his fair share of stages for sure, but it was Peter Sagan, racing in his first Tour de France ever, that stole the sprint finishes and won the green sprinter’s jersey. He announced himself in style on stage 1 when he crossed the line doing the “Forest Gump”. Chris Froome had more to give. 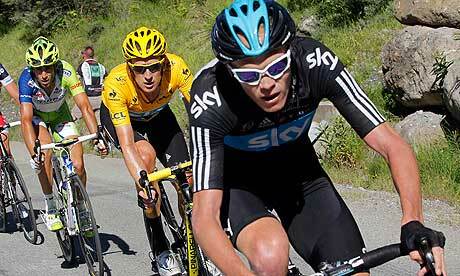 Chris Froome paces Bradley Wiggins up a mountain. 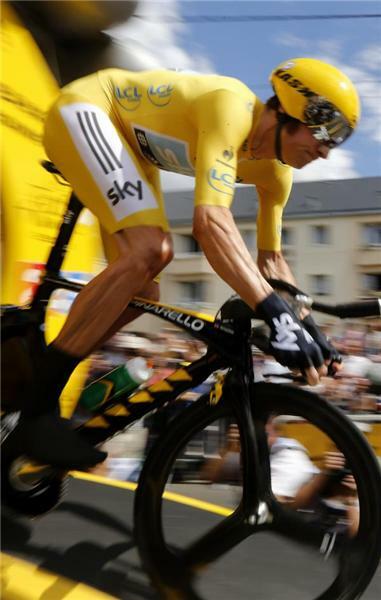 Chris Froome proved that he had what it takes to ultimately win the Tour de France. But there was a problem. He was riding on the same team as his teammate and team captain Bradley Wiggins. On more than one occasion, Froome was shown dropping his team’s captain on his way up the high mountains. I got the impression that there was some miscommunication that lead to these moments as he would quickly slow down his pace and let his captain catch up so that he could resume pacing him up the mountain. It was easy to tell that Chris Froome was clearly the best rider of the high mountains this year despite not winning the King of the Mountains jersey. He won something better, 2nd place at the Tour de France. Chris Froome’s story will be the one to follow in the off season. Will he remain on Team Sky or will he go to another team that’s in need of a GC rider? Time will tell. Marc Madiot screams at Thibaut Tibot on Stage 8. French rider Thibaut Tibot would attack on Stage 8 of the Tour de France and would go on to inevitably win the stage. That’s all well and good but the memorable part of the day was when team manager Marc Madiot was shown on the TV riding in a car behind him encouraging his rider by yelling at him. This is odd because all of the riders in the race wear radios so that they can communicate with their team’s manager. Madiot was apparently so excited he would forego the radio in favor of yelling out the window. This video does not accurately capture what this was like. He yelled for about 5 minutes straight. Thomas Voeckler wins the King of the Mountains title for France. France loves their riders and Thomas Voeckler winning the King of the Mountains classification was a wonderful moment for France. Most riders will don some sort of special equipment to match their jersey in the event that they were to win one of the special jerseys from the race. Thomas Voeckler may have taken things a little too far though. George Hincapie completes a record 16th Tour de France. 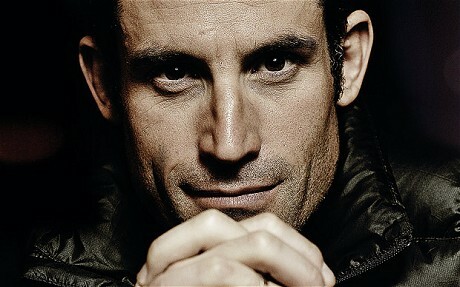 George Hincapie has been a part of 9 winning Tour de France teams and has completed 16 Tour de France races. It’s an astounding statistic when you consider how frequently people crash and end up abandoning the race. 198 racers started this year’s race and 45 people abandoned it. Nearly 1/4th of the entire field failed to complete the race yet Hincapie has completed it 16 times. For many riders, simply participating in the race is an honor. He’s finished it 16 times and won 4 stages. An incredible career. Hincapie has recently come under some controversy for allegedly outing Lance Armstrong, former teammates and himself for having used performance enhancing drugs in their careers. Certainly not the greatest moment of his career. Mark Cavendish passes Lance Armstrong for most stage wins in the Tour de France. Even without the dedicated lead out train, Mark Cavendish was able to win multiple stages of this year’s Tour de France, including the coveted final stage in Paris that he’s now won for a record 4th time. He wasn’t able to lock up the green jersey but he was able to pass Lance Armstrong and move into 4th place overall for stage wins at the Tour de France. Cavendish now has 23 stage wins while Eddie Merckx holds the record with 34 wins. There’s still a lot of work to do there for Cavendish if he wants that record for himself. Bradley Wiggins wins the Tour de France. I have no issues with Bradley Wiggins winning and honestly find him quite likable. It’s just less exciting when the favorite to win the race prior to the start goes on to win it. In Wiggins’ case, he wasn’t even tested. It was easy for him and that made it less exciting to watch. The race wasn’t as exciting this year without Andy Schleck, Alberto Contador, and Thor Hushovdt. Frank Schleck tests positive for a banned diuretic. Andy and Frank Schleck have always had the reputation of being clean riders that are good for the sport. That all went out the window this year when it was announced that Frank Schleck had tested positive for Xipamide. Diuretics are commonly used to reduce weight which would make riding in the high mountains easier but they’re also used to flush your system of other performance enhancing drugs. After testing positive, Frank Schleck immediately abandoned the race, declared his innocence by stating if he tested positive, he was poisoned somehow, and now he has requested that his B sample be tested. There is no ban that will be imposed for this infraction but it does tarnish his reputation considerably. A number of Lance Armstrong’s former teammates confessed to having used performance enhancing drugs in the past and accused Armstrong of doing so as well. This news came out during the first week of the Tour de France this year. Every year something like this happens on cycling’s biggest stage. These accusations always come out when everyone is paying attention to the sport of cycling. This case is high profile and we’ll see what happens next. Crashes are incredibly common during this race and riders are frequently forced to abandon. I’m unaware of what the record is for most abandons but I do know that 45 abandons is more than what has happened in any edition of the race in the last 5 years. The final stage of the Tour de France is largely a ceremonial showcase for the winner of the yellow jersey, as well as each of the other jersey winners, but it’s also the final opportunity for the sprinters to capture a stage victory. Traditionally, the winner of the tour poses with his team and the other jersey winners at the front of the peloton for photo opportunities. 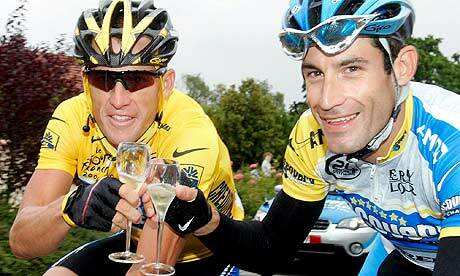 Sometimes they celebrate by sipping some champagne on the ride as well. In this year’s race, it is also the final opportunity to pay homage to George Hincapie, the only man to complete 16 Tour de France races. Prior to the race, Big George had announced that this would be his final race. Normally it’s enough just to recognize someone that’s completed so many grueling races but Hincapie’s contributions go well beyond just finishing the races. Hincapie was on 9 different TdF teams that had the overall winner of the Tour de France. 7 were with Lance Armstrong, 1 with Alberto Contador, and 1 with Cadel Evans. That’s a pretty good career, even if it’s marred with controversy. Stage 20 has a small circuit that’s covered repeatedly up and down the streets of Paris near the Arc de Triomphe and the Chomps Elysees where the streets are lined heavily with hundreds of thousands of people cheering on the riders. Each lap of the route slowly gets faster until the final lap when the sprinters take over. Mark Cavendish has never lost this stage and is considered a huge favorite to win the stage. Team Sky has locked up the 1-2 finish with Wiggins and Froome and are expected to ride in support of Cavendish in order to give him the stage win. There is always a break away team on the final stage though. They never survive. This year, there were 11 riders on the break away stage. At one point, 3 of them survived and they had opened up a time gap of about 24 seconds at the peak. They wouldn’t survive though. The peloton, lead by teams Liquigas and Sky would crank up the speed and ultimately chase them down with about 1.6 miles to go. The sprint teams would be able to line themselves up to create lead out trains for their sprinters. Wiggins lead out Boasson Hagen and Cavendish with .5 to go. They were in perfect position. Cav fired on the final straight away and easily took the stage. It’s the perfect ending to the perfect race that Team Sky ran. L to R, Sagan, Wiggins, Voeckler, and Van Garderen. Time trials are typically not the most fun events to watch on TV but they are the purest form of competition available during the bike race. Each of the riders will race the same course, one at a time, and whomever does it quickest that day will be the winner. It seems logical but it’s a different strategy than what normally happens in a bike race. You see, it doesn’t matter how quickly you race any individual stage, it just matters that you finish first. Conserving energy until the very end is one of the most popular strategies. But as I stated, that strategy will not work in a time trial. If you’re going to do well, you’ll have to sprint for about 30 miles and hope you’ve done well. 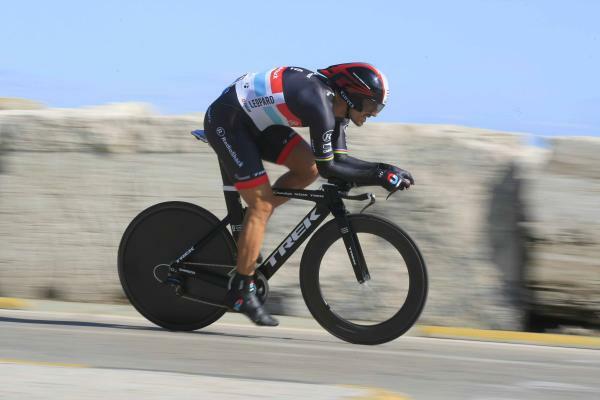 Fabian Cancellara is a master of the time trials and thrives on the more technical courses that tend to have hairpin turns. 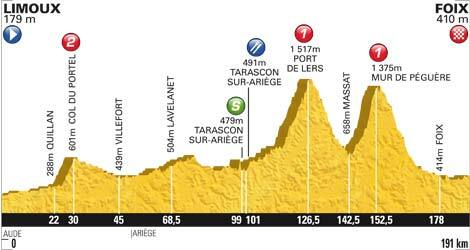 Unfortunately for Cancellara, today’s course is not technical and therefore doesn’t favor him as much as usual. There’s a saying that the man wearing the yellow jersey is able to ride with the strength of a dozen men. I expect that would hold true on today’s time trial and the stage win should go to Bradley Wiggins. They start the riders based on their overall position in the race. The racer in last place will start first and the rider in first place will go last. This is an advantage to the riders in the top 10 because they’ll have received a lot of feedback from team mates about the course and they’ll know what time they have to beat in order to win the stage. Through the intermediate check point, 2011 Tour de France winner Cadel Evans was only in 55th place for the day. A poor performance for sure. Tejay Van Garderen set a new best time when he crossed through the intermediate check which signals that he’s potentially a future Tour de France winner. Then Chris Froome would set a new best at the check point which wouldn’t hold up for long. Wiggins would do what many expected and post the best time at the check point, by 12 seconds, an eternity by these standards. Cadel Evans’ form was so poor on this day that Tejay Van Garderen would be able to chase him down over the 3 minute lead time and pass his team mate. It was the most literal passing of the torch you could ever see in sports. It was a new day for team BMC and that day was Tejay’s. Wiggins was an astonishing 53 seconds faster than Froome through the 2nd check point. He’s on pace to lay waste to the field. Cadel would wind up finishing over 4 minutes behind the day’s stage winner. 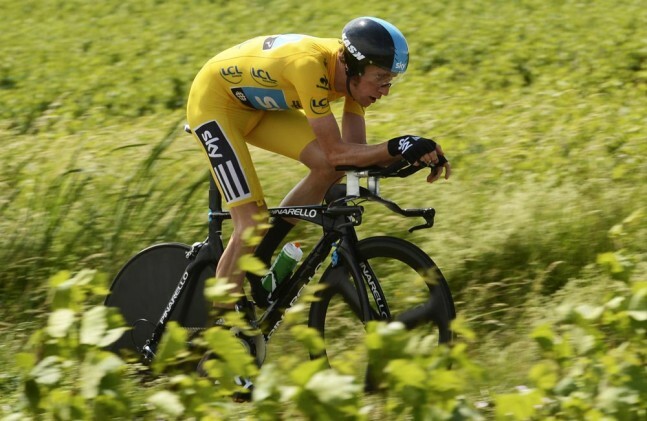 Chris Froome would set the best time of the day when he crossed the finish line but that wouldn’t stand for long as Bradley Wiggins went on to win his 2nd stage of the 2012 Tour de France by a staggering 1:16. Bradley Wiggins celebrates winning the stage! Wiggins has dominated this tour from wire to wire. It’s nice to see him celebrate now that the pressure is officially off of him. With one stage remaining, he’ll ride into Paris tomorrow in style. The final stage of the Tour de France is one for celebration for each of the men donning one of the coveted trophy jerseys. This stage is also the most coveted stage win by all of the sprinters as the crowds are enormous. Expect Mark Cavendish to get one more stage win as he inches closer and closer to becoming the all time stage winner at the Tour de France. Stage 18 produced one of the most exciting finishes of this year’s edition of the Tour de France. A large break away formed early with 16 riders. Included in the bunch were Vinokourov, the rider I predicted that would win today’s stage. Vino would attack repeatedly until he was able to drop all but 2 other riders in the break away. A 3 man chase group would form and eventually ride across the gap to reform a 6 man break away. The peloton was in hot pursuit because they wanted to setup their sprinters for the finish. The pace of the last 10 miles was ridiculous with the break away fueled by Vino and the Peloton by the sprinter’s teams. And then it rained. It felt like anything could happen at the finish. The break away could survive. Vino could get a stage win in his last Tour de France ever. The peloton could catch them. There could be a huge crash near the finish line. Anything could happen but whatever the finish was, it would be exciting. During the final stretch, Wiggins lead out Cavendish again — something no other man that sported the yellow jersey would consider due to the risks involved. Wiggins peeled off and Cav sprinted across the gap that now contained only 2 break away riders. Vino fell off and would not get the stage win. 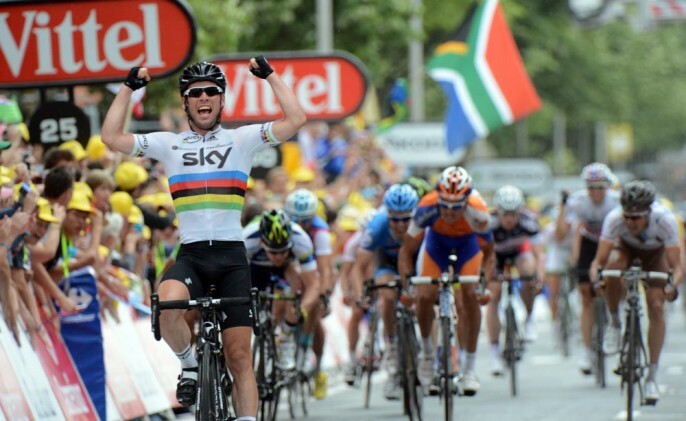 Then Cavendish kicked into turbo mode and destroyed the field. The ease in which he accelerated was unreal. It was his stage all along and he knew it. Here’s footage of the finish. Cavendish was in a league of his own today. Stage 19 Profile. 33 mile Individual Time Trial. Expect the Time Trial specialists to be in the mix including — Bradley Wiggins, Fabian Cancellara, Tony Martin, and possibly Cadel Evans. Well, the Tour de France was unofficially won today when the 1-2 combo of Froome and Wiggins charged up the mountain thus putting even more time between themselves and Vincenzo Nibali. The stage was pretty exciting though. Team Liquigas lead most of Peloton today in an attempt to setup Nibali for an attack, which never came. Frenchman Thomas Voeckler was out in a breakaway for the majority of the day in an effort to secure the King of the Mountains jersey. Controversial rider Alejandro Valverde won the stage by about 20 seconds today with Chris Froome and Bradley Wiggins finishing 2nd and 3rd. Chris Froome has been the real story of the 2012 Tour de France though. He was totally able to chase him down but he instead chose to stay loyal to his teammate Bradley Wiggins and waited for him on a number of occasions during the final climb when he could have been chasing down Valverde. Wiggins and team Sky have held him back this year. 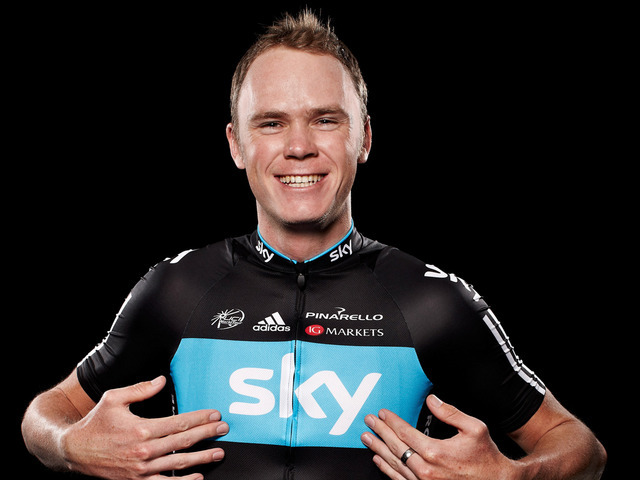 Chris Froome will win the Tour de France in the future. It’s also worth mentioning that Team Radio Shack has 4 riders within the top 16. Had Andy Schleck been able to compete this year, things may have been very different considering how dominant they’ve been as a team. 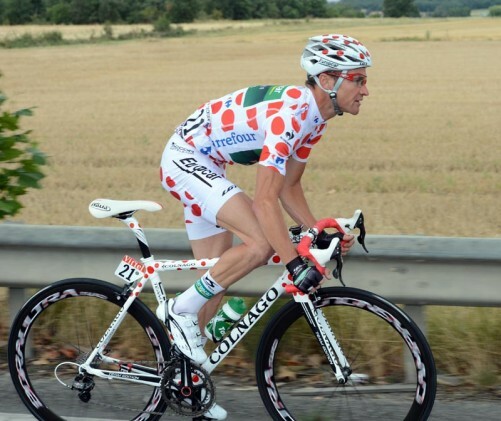 Voeckler should be able to hold onto the jersey pretty easily now. Sagan has destroyed this race. Van Garderen just needs to not give up 3:16 in the final time trial and he’ll win the best young rider competition. Lots of little hills makes it possible for a breakaway to survive. I like Alexander Vinokourov, who’s racing in his final Tour de France to get the win tomorrow. 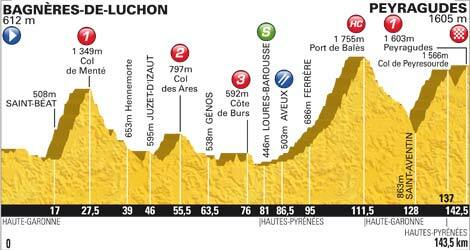 The King of the Mountains race was fully underway today as it’s one of the final mountain stages of the 2012 Tour de France. Points are awarded for the first few riders that reach the apex of each designated climb. It’s really a badge of honor and the most coveted jersey available aside from the yellow jersey. It implies that you’re the toughest racer in the tour that year and that you conquered the Alps and/or Pyrenees better than any other racer. Races like the Tour de France are typically won in the mountains where only a handful of the riders are able to push themselves to the point where they’re able to outperform the bulk of the other riders in the race. The rider that gets the polka dot jersey is typically someone that either has a weak team around them that aren’t good at pacing their climbers up the mountains or are generally poor at the time trial discipline where they lose too much time to overcome. When Frank Schleck lost too much time during the time trials (and then some more due to a crash), I figured that he would be going for the King of the Mountains classification. He abandoned the races yesterday after testing positive for a banned diuretic though. The next guy that I thought would make a run for the King of the Mountains jersey was Thomas Voeckler. He made a run during stage 10 for the points but he didn’t make any effort for them in stage 11 so I thought he might not be trying for that jersey after all. Today proved me wrong when he attacked early with two other riders, one of whom was dropped early. Voeckler would go on to take maximum points at the peak of every mountain today. He attacked the only other rider that was with him on the final climb, opening up a lead of about 1:30 and then went on to win the stage. Voeckler has become the favorite son of France in this race over the last couple of years. Today he’s likely fulfilled a dream of his by taking over the King of the Mountains jersey with only one high mountain stage remaining. There are probably other points available for the competition but they’re unlikely to impact the jersey points race. The jersey will be won for sure at the conclusion of Stage 17. Cadel Evans again showed weakness when he was dropped on the final climb and his team had to pace him back up to the group with Tour de France leader, Bradley Wiggins. He certainly hasn’t looked like someone that was capable of winning the race this year while Wiggins has looked like a machine, riding his own race while almost never reacting to any of the attacks from the hopefuls, though he and his teammate Chris Froome did respond to the attack of Vincenzo Nibali today on the final climb. They didn’t get out of the saddle and aggressively match the attack set forth by Nibali; they stayed in the saddles and simply kicked up the speed a bit to reel Nibali back in. Wiggins looks unbeatable this year and will go on to win the race due to his uncanny ability to ride a steady high-pace up the mountains which very few others were able to match. The last nightmare of the 2012 Tour de France. If Voeckler’s going to win the King of the Mountains classification this year, he’ll likely need to win the stage. If Vicenzo Nibali wants to finish better than 3rd this year, he’ll need to win the stage. Cadel Evans has dropped to 7th place overall so if he wants to finish on the podium, he’ll need to win the stage. It’s just that simple now. It was just announced that Frank Schleck has tested positive for the banned diuretic Xipamide. Diuretics aren’t technically performance enhancing drugs in the traditional sense, but can be used to reduce weight which can help a rider go faster, especially in the mountains. 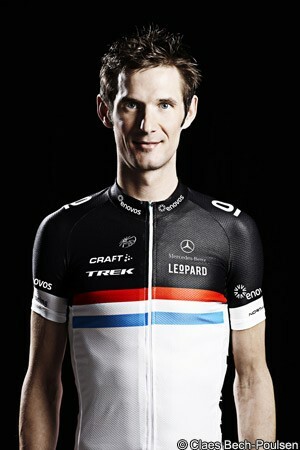 The B-sample has yet to be tested but it is expected that Frank Schleck will be suspended immediately. Stage 15 was boring until the last few miles. A break away got out, opened up a 10 minute time gap, and survived. French rider Pierrick Fedrigo attacked the break away group in the last few miles. They failed to counter so Garmin rider Christian Vande Velde rode across the gap to prevent him from getting a walk at the line. It was exciting because the American has tried this before and it’s clear that he really wants a stage win today. Unfortunately, Fedrigo did too and he was faster. Fedrigo got the stage win. The peloton weren’t interested in chasing them down and took it easy on this stage prior to heading back into the high mountains. Tomorrow’s stage will be very telling. A series of HC and Cat-1 climbs followed by a descending finish. There will be attacks by GC contenders and you have to expect that Cadel Evans will do everything he can to win the stage. 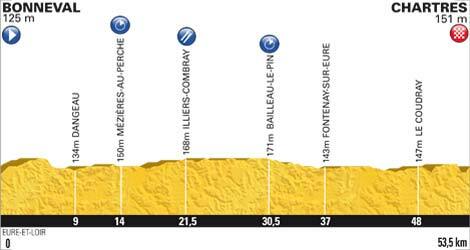 A break away of 11 riders has a massive lead of nearly 15 minutes on the peloton and I believe that one of these riders will go on to get the stage win today unless Cadel Evans and Vincenzo Nibali attack in tandem, which I do not expect to happen. Rain began and worsened on the descent of the Port de Lers climb. The wet pavement would prove to make the decent slick and scary. The riders were quick to put on their raincoats before the descent started. 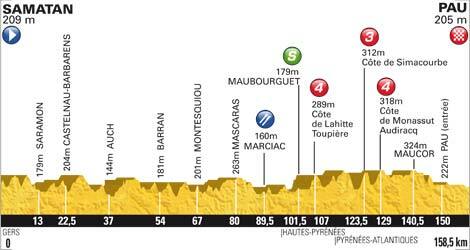 Peter Sagan and Philippe Gilbert are among the riders in the lead group which makes me think that they’re expecting their team mates, who are currently in 3rd and 4th place over all, to attack on the second climb in an attempt to make up time on Wiggins. Louis Leon Sanchez would do his best to thwart that plan when he attacked on the 2nd climb. It was a good move because he immediately got rid of 5 of the riders in the group and 2 others, including Sagan, would drop off the leaders but do their best to keep them in sight. Sagan would eventually catch up with the group when French cyclist Sandy Casar launched his own attack to reach the top of the mountain first. When the GC riders got to the second climb, the roads were so narrow that they could only ride at a width of about 3 riders at points. It looks very dangerous, not to mention incredibly hard. Team Sky quickly regained control of the group and that would make it very difficult to for anyone to launch an attack. At the summit of the climb, Cadel Evans hopped off his bike and waited for his team’s mechanic to replace a flat for him. The good news for Cadel was that his team mate George Hincapie caught up to him and waited for him. Evans would two additional flats on the descent. He lost a lot of time but team Sky slowed down their pace, perhaps in a sign of sportsmanship. Evans was a total of 2 minutes behind them. It turns out that there were at least half-a-dozen flats here and it was later confirmed that dozens of tacks were discovered on the road. Wiggins was also a victim with under 10 miles to go. Louis Leon Sanchez attacked on his own with about 6 miles left in the stage and quickly opened up a 15 second lead when no one countered. This is a move that would prove to hold up as the remaining 4 riders chasing Sanchez would not be able to catch him. 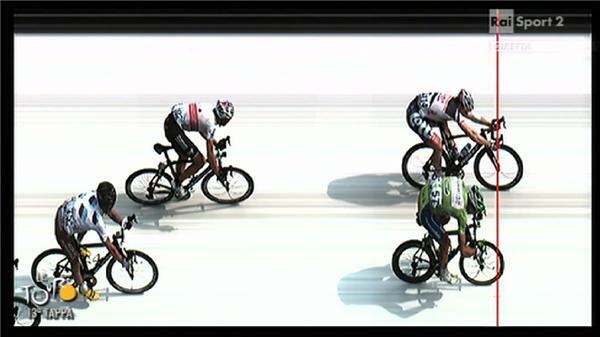 The remaining 4 riders would sprint for 2nd place but Sagan easily took the line first. The riders in the GC group slowed their pace to that of us mortals in order to let Cadel Evans catch up to them. It wasn’t Evans’ fault that he had all those flats and they weren’t going to punish him for it. It was a wonderful show of class by Team Sky. 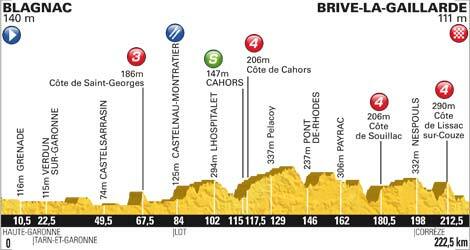 A series of rolling hills will prove difficult for the sprinters but I expect one of them to win the stage and it will likely be Greipel or Cavendish. That tiny little Cat-3 blip on the profile known as the Mont Saint-Claire turned out to be very steep and played a much larger part in the stage than I had anticipated. Cadel stayed true to his mission and was quick to attack on the climb. The GC leaders quickly caught up to him and nullified the attack. Cadel’s intention to attack was quickly turned into him pacing the leaders up and over the hill. This did nothing more than drop all of the sprinters out of the peloton. They would have to play catchup now. Alexandre Vinokourov would attempt an attack immediately after the climb. Vino, as he’s commonly called, was said to be riding in his final TdF last year but a tremendous crash in which he broke his femur ended his race prematurely. Like any competitor would, he decided to give it one more try and he clearly wanted to get one final stage win. Team Lotto would begin forming a lead out train for Andre Greipel and Peter Sagan would latch right onto his wheel. Boasson Hagen was also in on the train. 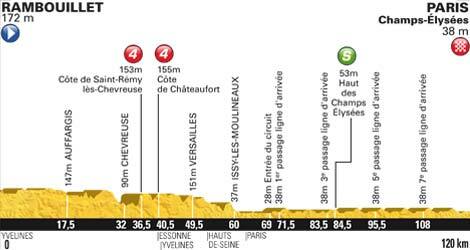 The leaders would be caught within the final mile and the speed would be so great that the peloton would be decimated. All that was left was the lead out train for the few sprinters that were left. Friday I stated that there would probably be some horrendous crash at the end of the stage but that climb would prove to be too much for the sprinters to handle. The good news is that there would not be a big crash at the finish today. Louis-Leon Sanchez would be the first to attack but he lead out WAY too soon. Then, in a move that no one could have imagined, Tour de France leader Bradley Wiggins would crank up the speed for his team mate Boasson Hagen leading him out to try and get him the stage victory. In the end, it wouldn’t be enough as Team Lotto’s Andre Greipel would capture his third stage win of the race. Sagan comes in second about a foot behind him. 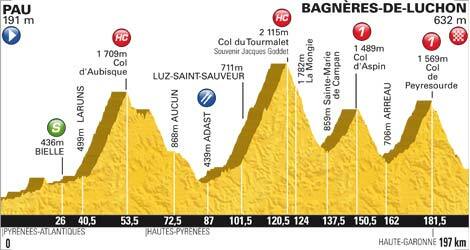 It doesn’t even look possible to walk up those two climbs and some how, these guys are going to ride up and over them.